I am looking for advice, any and all concerning driving a horse. Ground driving, exercises, what to do, what not to do, and what to avoid when purchasing a harness used or new. There are many harness types available.. could someone please explain their purposes and differences? What sort of a cart & harness should I be looking into - to start? I'm thinking Nylon would NOT be a good idea? I hate nylon everything. What about leather VS. Synthetic? I was thinking some sort of easy cart, or sulky type but I'm not really sure what I should be looking at. Willow is a steady eddie type horse.. she is a wonderful trail/parade horse and I feel like this is something we could both enjoy. She hacks solo to perfection and it takes A LOT to spook her. ohh ohh - where to start?! Personally, (and speaking from experience), I like leather because if there is a wreck, it breaks...no one wants to see a wreck with equipment that does not break, or can't be cut easily...know what I mean? Scary stuff. Ours is a mix, put together over the years. I would think that light horse would fit her...Arrow is about the same size, and while some of it is light draft, we had to get the belly girths shortened to fit him properly. He's kind of in between, too. Here is a picture of him in harness, this year. The britchen was made for us years ago, for my little mare, we had the straps lenghtened so it fit him better. My husband is the resident expert in harness driving, he likes starting them in a sleigh rather than a cart. He starts by ground driving them first with lines, then rigged up to some weight, like a tire or a pallet with tires on it (he hooks that up with a spare swing he has, and traces). Some horses will go fine in an open bridle, some need blinkers. He also prefers the collar and hames rather than a light driving breastplate, because he feels it's easier for the horse to pull. Anyway - enough from me! There are other drivers on here too!! Keep us posted! Editted to add - you may find this interesting, too! Well it's a bit hard to explain on here, it's something that for yourself who is not experienced to have someone who is to come and help you. But I highly recommend sending her to someone who has harness broke a number of horses with no issues. The thing is if you get in a wreck chances of that horse ever getting over a bad wreck is unlikely. They don't forget a bad experience like that. We break all of our colts with a well broke, bomb proof, been there done that horse so that if there were problems you have that other horse to guide them. It's less likely you'll get in a mess when hooking with a horse that has broke colts. Everyone is different but my father has broke tons of horses and never had issues (knock on wood). As far as harness goes, we prefer leather here, it is heavier though to lift, and we do have a set of nylon although my father doesn't care for it but since permanently injuring his hand for life he finds the nylon easier for him to lift. But when breaking the colts we always use the leather. Thanks for the replies! keep em' coming! Ellie, thank you for the information! your horse is so beautiful! Jorgia, Willow and I live in Fredericton. I don't have a truck, nor trailer but I could arrange to have her trailered and temporarily boarded and trained somewhere at a reasonable price. I can always seek help from the barns lovely neighbour as she drives her Kentucky mare and plans to hitch her Gypsy Vanner filles when they are older. She has a harness that would fit Willow, perhaps I could play around with hers before plunging in and purchasing my own. I'm not so sure that Willow would handle being hitched to another horse well.. She is a real snot with unfamiliar horses, or those she choses to befriend. She seems to choose one horse at the farm that she's 100 percent comfortable with, typically the alpha mare which is luckily my best friends mare. Other horses when in her bubble she pins her ears, stiffens up, and would lunge if given the opportunity which I never allow. (Unless she's in heat.. then she's the worlds most friendliest horse) Multiple people who know Willows mom in NS have told me that her mother was a MEAN horse when turned out.. wayy worse than Willow who is just food possesive with her pasture mates, not lead mare.. high in the hierchy but not top. I'd have to really know that the person training Willow & I knows their stuff.. I don't know enough about driving to call someones bluff or know when I'm being given improper advice. I'd highly recommend Jorgia (or her dad) I've seen them at shows and been on several of their wagons/sleighs, I'd trust them with my own horses and I dont let mine go anywhere unless I'm hands on with them. Well I would highly recommend that you find someone that has lots of experience and knows what they are doing right down to having the harness fit properly. Because the least little thing if she gets away on you that is a disaster you do not want your horse to go through. We only break young ones with as I said a bomb proof horse, you have so much more control. The other horse is used to guide them. And I know that some horses are snotty because we have some of those as well but they never bother with the other horse. We hook our stallions with mares that are in heat and he never flinches. It's different when they're working and their mind is preoccupied. If you want you can pm me. Aww thanks Syl.. Dad has broke tons of horses although hasn't done much in the last 2.5 years as he hurt his hand permanently. He may end up taking some in now as he's back to work, but we wouldn't have room until spring. 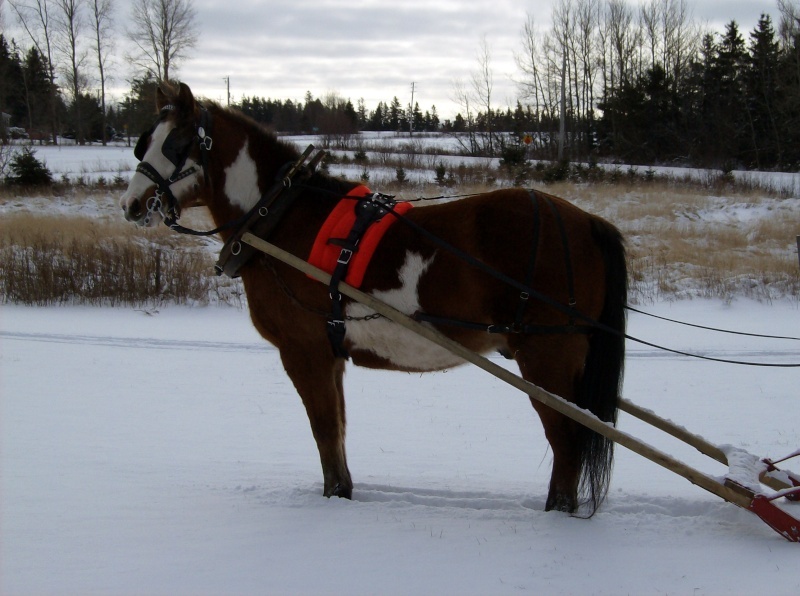 Although the best time to break a horse to harness is hooked to a sled with a good trail.